female Red Tails, Finish Goshawk, or similar. SKU: ffcj. Category: Casting Jackets. 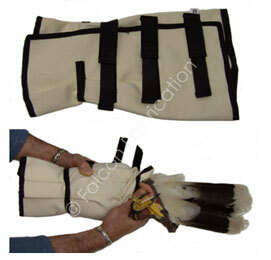 This has been designed for the safety for both the bird and the falconer! Made from breathable canvas, this casting jacket is easy and safe to use! The elasticated velcro-straps make it virtually impossible for the bird to injure its self or escape free! Ideal for replacing anklets / coping / attaching tail bells or administering First Aid safely! Suitable for female Red Tails, Finish Goshawk, or similar.